The Poles love their music. Poland is Chopin. 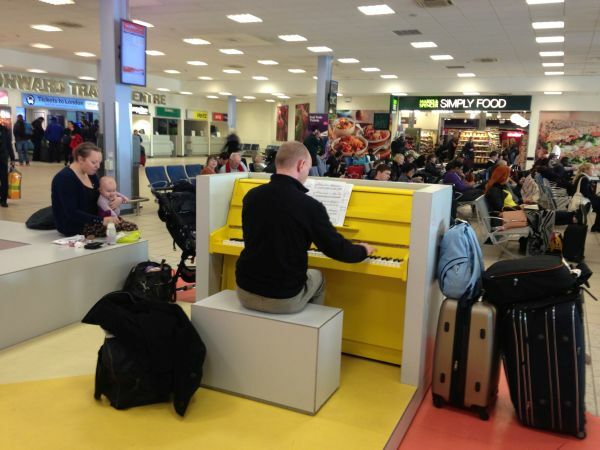 With major building works about to start Luton Airport is all out to keep its users happy and a piano has been installed in the arrivals hall for anyone to use. In the bright new colour scheme too. BTN found Kojtek Rvdmicki from Głogów well into a prelude. Wizz should sponsor the piano! In mauve off course. Yes,but what is the most appropriate music? My three instant candidates: I'm Walking in the Air. I'm on Cloud Nine. A Foggy Day in London Town.